One can ‘force’ the menu to appear on right click by removing the ‘Extended’ value (you can see it on the screenshot below where I removed that entry and the command appears on the menu). Then there is one more interesting bit – we can add menu items that shows up only when the user clicks the ‘white’ space of the opened folder. This is pretty cool, as we can add both right click, and extended right click menu there as well + users do right click on that white space a lot. Little persuasion, and they may actually click our entry. For the SHIFT+RIGHT CLICK we just need to add the ‘Extended’ value. 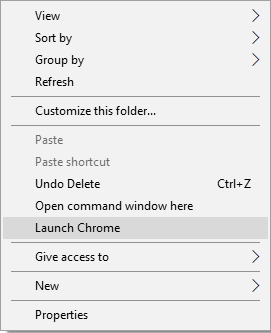 Again, this particular menu is activated ONLY when the user right clicks on the folder’s white space (‘background’). This MSDN post provides some more details, same as this discussion on StackOverflow.